Since 1977 there has been a no-fault system of divorce in Germany – something that many have called for in England and Wales. This means once the court is satisfied that the marriage has finally broken down it will grant a divorce. If the spouses have been separated for one year and both request a divorce or the respondent consents to a divorce, there is a presumption that the marriage has broken down. If the couple has been apart for three years the court will also presume the marriage has ended and will grant a divorce – even if one spouse does not agree. Section 1565 of the German Civil Code allows for a divorce before one year’s separation if the continued marriage would mean unreasonable hardship for the petitioner. Courts will decide issues relating to maintenance, child arrangements and any overall financial settlement. German law considers each spouse the sole owner of assets he or she owned before the marriage as well as any acquired by him or her during the marriage. If requested by one or both parties, the court will carry out a rebalancing or equalization exercise of those assets acquired during the marriage, including pension rights. 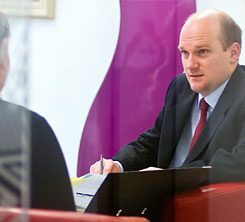 We are specialist family lawyers and divorce solicitors, based in London, and we advise clients who have a connection with Germany. Our clients can include those who are UK–based but originate from Germany, are living in Germany but have a connection with England or Wales, were married in Germany, or have other family connections with Germany.